The Royal Bafokeng Stadium is one of many in Southern Africa where a large variety of sporting events take place. Located in Rustenburg, North West Province near the Magaliesberg Mountain Range, the 1999 created stadium remains a hot topic for all types of sports. Not only is it a popular hosting location for various sports including soccer, athletics and rugby, it also played a part in the 2010 FIFA World Cup that was hosted by South Africa. Since it’s completion in 1999, the stadium went through various changes in preparation for the world cup. There were many changes to the stadium, including adding an impressive 4,000 seats to the original 38,000 it had before the world cup. This included the extension of the main west stand while also adding a roof to the west side. Further upgrades include a new electronic scoreboard and various upgrades to other sections, including the PA system and the floodlights that turned this stadium into the perfect football destination for the world cup. Today, it’s in much better shape than it was before the world cup, not only due to the upgrades but because it forms part of South African history as well. There’s a lot of interesting details about the stadium, including the fact that it’s the only stadium that’s community-owned in the whole of South Africa. It also features a lot more than just a sports field as seen with many other stadiums as the Royal Bafokeng Stadium offers an Olympic swimming pool, tennis courts, athletics track around the field, basketball courts volleyball courts and a fully-equipped fitness centre for the athletes. When it comes to enjoying the most out of each event at the stadium, it also impresses with a screen of 40 square meters that offers the perfect view for everyone at the stadium. For the VIPs, the stadium offers an impressive 320 seats along with multiple other levels that allow everyone to attend each of the events hosted by the stadium. Since the renovations, the stadium was quickly selected to host various major events for the 2010 FIFA world cup. It all began in 2009 where the stadium was used for 4 of the Confederations Cup, including New Zealand vs Spain (Group A), South Africa vs New Zealand (Group A), Egypt vs USA (Group B) and Spain vs. South African for the third-place match. In the 2010 FIFA World Cup, the stadium was selected to host 5 of the major events, which is where Bafokeng really made a name for itself. These events include England vs the USA (Group C), New Zealand vs Slovakia (Group F), Ghana vs Australia (Group D), Mexico vs Uruguay (Group A), Denmark vs. Japan (Group E) and finally, the USA vs Ghana in the round of 16. 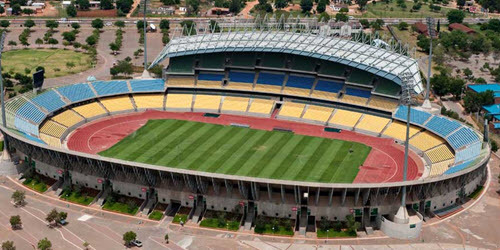 The stadium was also used for the Africa Cup of Nations in 2013 and has since been hosting a range of other sporting events, of which most are soccer. However, there are also many other sporting events that take place regularly, thanks to all the sporting options available.